Are you interested in key figures such as staff turnover rates, headcount development, FTE or sick days per employee? Do you need reports on the age structure or salary development of your workforce? An overview of incoming job applications or different working time models? Then rexx HR Data Warehouse is just right for you! At the touch of a button, the statistics and key figures in rexx Recruitment let you see, for example, how many applicants have been processed in the last few months, how many interviews have been conducted and from which source successful candidates come – up to date and accessible from wherever you are. You also have the option of exporting the data directly to Excel. You can save newly defined reports conveniently so that they are accessible at any time at a click of the mouse. And the data is available for retrieval at flexible intervals, either for the entire company or for individual organisational levels. This is also how you make KPIs available to the different managers according to hierarchical access rights. Do you require information about the age and employment structure of your workforce? One click and you have access to the desired key figures in a report for any period of time, organisational unit or employee group – always up to date. And the integrated rexx Diagrams provides you with a graphical presentation of your report. Everything at a glance in seconds! Would you like to display your employment structure as a pie chart or represent the development of people joining and leaving the company graphically? Paste your individual quarterly report into a presentation as a chart? It’s easy with rexx Diagrams! The selected key figures are presented directly in rexx HR as a graph, bar or pie chart. In a correlation of own actions versus own results, rexx CRM Data Warehouse gives both the sales manager and the individual sales representative a better perspective by enabling a direct comparison of visitor activity and sales. The activity overview provides the regional manager or sales manager with an insight into field sales activities in the regions or individual areas. 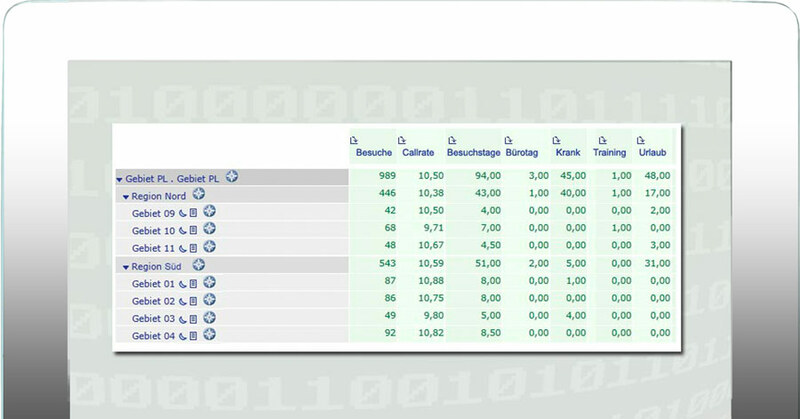 Data from the field sales representatives’ reports are automatically incorporated into the overview. The nature of the activities is freely configurable, as is the time period. Through the use of drill-down technology, you can navigate from the general overview to individual visits.